The lake has been a much better in the Buckenderra,Seven gates,Rushy's area with a few good browns and Rainbows being taken in the evening. There are still enough of those fat browns around to keep most anglers happy.There has been some good Browns around Buckenderra. Woolly buggers have been working well and black B/H Nymphs are keeping the big fish interested. now the days are getting warmer and a little windy start getting them fly's down to where the Rainbows are the big browns are starting to come in closer well worth walking around buckenderra. best areas are buckenderra, seven gates, dam wall. Quick pic from last weekends Fly Fishing efforts! Saturday was a right off with the howling wind but Sunday made up for the previous day and the 3 weeks I hadn't been back to the lake! 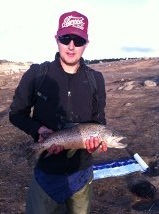 11 fish caught in 4 hours, all around 2lb with one at 4lb (pic attached). All fish caught on a dark Cahill wet. Lake has dropped a lot but doesn't seem to have deterred the fishing, they're still feeding! Good times to be had this coming season! Lake Jindabyne..Not much has change fishing is still going well and there are planty off fish around the weedy areas the Rainbow and Browns are fat and moving around looking for food. 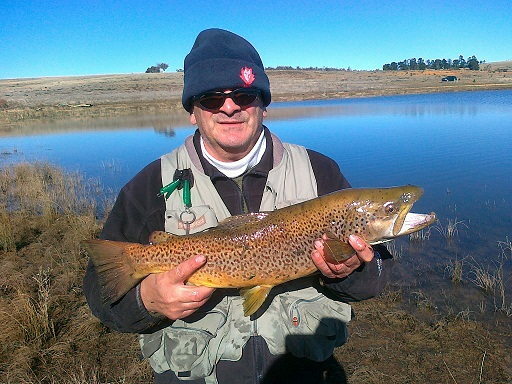 Attatched a photo of a brown caught at yens bay last Month. Had great falls of snow in the park last week and the weekend we saw magnificent weather. The fishing was a little slow to begin with not to many caught but as the weekend progressed we heard more good reports.Power bait anything with orange done very well the largest caught was 40cm and just over a kilo, spinning the best was using a small Tassie devil the largest was a brown 5lb caught at Wanui Bay.Trolling was excellent on Sunday especially heading towards Middlingbank some of the men caught up to 10 over the weekend they were still catching them closer to the bank so not really deep at the moment. And finally the fly fishing it has been excellent the largest caught on a Green Nymph 2.3kg brown at 57cm also Green Woolly Buggers and Black Midge done well.That’s it from team a Buckenderra hope to see you soon. Eucumbene:- Reports from the lake have been good.Launching access is available at Old Adaminaby, Anglers Reach, Dam Wall, Buckenderra. With cooler conditions there should be a few more fish taking shallow running minnows and Tassie Devils, strike pro blades and XRap Rapalas, RMG Scorpions this week. Mostly flatline tassies and small minnows. There are fish in close and on top early in the day but as the sun gets up going wider and deeper is the best bet. Remember when Launching your boat or Driving around the lake you can get bogged with the edges been very soft so take care. Not much has changed over the past week but the fishing is still going well. 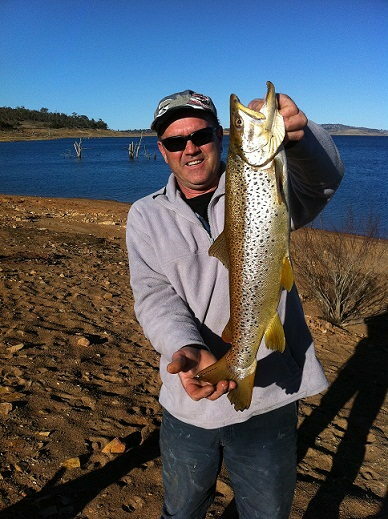 i just thought i would share with you some photos and a trout i caught at lake eucumbene on saturday. it measured 58cm and weighed in at 2.75kg. on that same session i also caught a 56cm and a 52cm. 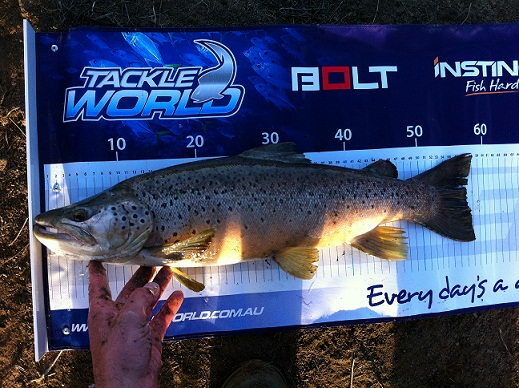 they were all caught on a rapala 90cm jointed hardbody lure in brown trout colour. before i go fishing i always have a look at your website for the latest in fishing reports and info, thanks a lot. 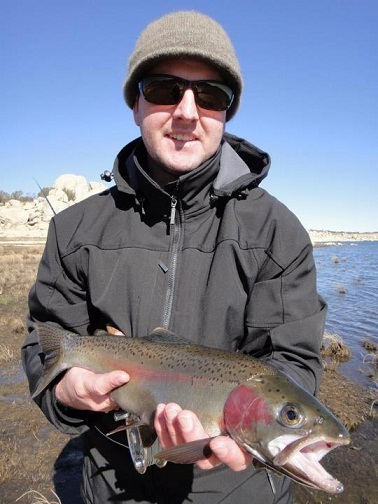 Eucumbene bait fishing:- Power bait has slowed down in the last two weeks worms and Grubs have been the best bait with some good browns and Rainbows feeding off the bottom. We took a midweek trip to Old Adaminaby. Arriving at 3pm we located a lovely spot on lake Eucumbene. 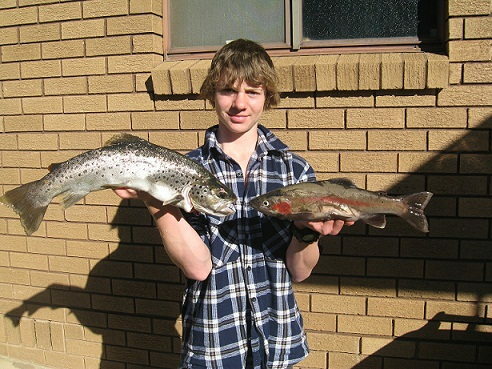 these two fish were caught around braemar bay on powerbait and 1 small rainbow was released. the bigger fish weighed at 4.25 pounds. 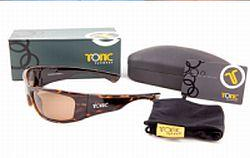 Polarised sunglasses that cut glare without losing clarity. By creating a lense that incorporates four colours, and coating the inside of the lense with an anti-reflective film, the wearer will enjoy true eye protection without losing any colour perception. A decentred lense allows the wearer to see straight ahead, up and down and also peripherally, without experiencing any optical distortion. In addition the new glass lenses are a lighter weight and come in a choice of grey or photochromic (darkens automatically according to light conditions) copper. There is also a polycarbonate lense version in grey or copper.